We still have a few more steps to do to complete this process. Texts highlighted in yellow are steps needed to be taken. Your generous support to help MAKATA assist other coastal communities in Madang, PNG to establish their marine resource management plans will be highly appreciated. Please contact Wenceslaus Magun on: magun.wences@gmail.com and make your donation. DEVELOPED BY THE PEOPLE OF MUR COMMUNITY, RAI COAST MADANG PROVINCE WITH ASSISTANCE FROM MAKATA INC. The idea of conservation or management is linked with an icon, one of the prehistoric reptiles of all time, the leatherback turtle. This animal was used traditional as a means for the famous barter system, the coastal communities would trade the leatherback turtle for garden crops. This was a traditional practice for this community; however locals did not know that this assess was not going to be around for long if there were no actions taken to protect them as they were historically part of history. The people of Mur have expressed their desire to manage their resources and have therefore sought assistance from MAKATA Inc, to facilitate a process to achieve this desire. The seven clans that have traditional ownership of the area met on the 22nd- 24th of September 2014 to agree to have a marine management area. 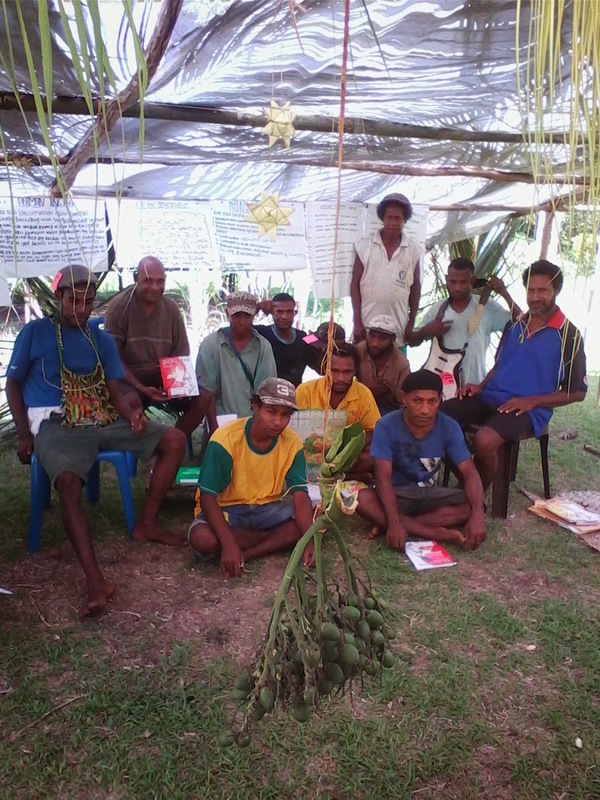 This plan is put together by the clans with assistance from MAKATA their overall vision is to: “MUR COMMUNITY HAVE RESOURCES IN THE FOREST, BEACH AND SEA AND ARE HEALTHY AND HAPPY. “Marine management committee”- the group that is responsible for the implementation and enforce the Community resource management plan. “Management area” - traditional fishing and harvesting areas that have been designated for management by the local community. WP018 S 05.65033° and E 146. 49448° GALEMBA BEACH Border with Fanger Village to WP051 S 05. 63673° and E 146. 50627° Border with Fanger. Each clan has designated specific strategies within their clan areas and management would be solely their responsibility. clans and the number of people in each clan. The population is: Male 634; Female 369; Total = 1003.
feed, a skill he learnt from the agriculture officers based at Rai Coast District. There is a business operation within the area at Nom plantation which is a few minutes’ walk from Mur and is managed by Benny Leahy. There is a retail store and a wholesale there where people get their store goods. The company also buys copra and wet bean cocoa from the local people. Apart from the health clinic team and the Catholic priest’s visits, the Volunteer Service Organisation also pays visits to the community. The nearest airstrip is at Saidor government station, but most people cannot afford to meet the airfares. The most possible transport is by boat and dinghy. Their most frequent mode of transport is by walking. 1. Marasok 2. Maigomba 3. Kamdau 4. Sokila 5. Mur 6. Dawang. This plan was developed to protect and safeguard the community resources in the condition they are in before it is over exploited to the point where it cannot recover. The management plan describes the resources that the community value discussing their importance and their uses and the condition that these resources are currently at. It also goes on to discuss the threats and provides strategies or regulations and penalties to eliminate or control the threat to the important resources. Inclusive is a monitoring plan that will work towards measuring the effectiveness of the implemented management plan. The management plan will be implemented by the Mur community members. Cocoa , is a cash crop, primarily to earn income. A lot of the locals have fermentations that allow for them to dry their cocoa and then take it to the market for the buyer to pay cash. The locals are highly dependent on this resource as mentioned for income. Turtle. This animal is used for traditional purposes to trade. They don’t sell turtle meat and eggs. Traditionally, they killed turtles mainly to trade with the inland people for taro. Even today they still don’t sell them. They use it for their own consumption. Coral Reefs. This target resource provides for other important marine resources such as fish and shells. There are also cultural stories tied to this resource that the communities still treasure. Kunai Grass is used especially for roofing thatch. This material is available easily and therefore harvesting is over a large area. It is also cut and burnt to make areas for gardening. Locals also burn the grass to hunt for pigs. Sago palm. The bark of the sago palm is beaten for its starchy substance which is food for the local. The palm leaves are also used for thatch roofs, such as that of kunai grass. Also where sago palms are found there are small outlets of water where locals use for bathing and washing dishes. River. The locals use this area for washing clothes and dishes and bathing. The conditions of each target based on local observation are as follows and the trend of the resource overtime. The most threatened resource identified by locals can also be seen in the table prioritized below. 6. Traditional systems have died out so no respect from today generation. MUR COMMUNITY HAS RESOURCES IN THE FOREST, BEACH AND SEA AND ARE HEALTHY AND HAPPY. MUR MARINE RESOURSE COMMITTEE WILL TAKE LEAD AND MANAGE THEIR MARINE AND FOREST RESOURCES TO ENSURE THAT THE PEOPLE OF MUR LIVE A SELF-SUSTAINING LIFE. Objective 1: NUMBER OF FEMALE TURTLE NESTING WITHIN THE MANAGEMENT AREA INCREASES WITHIN 3 YEARS. Objective 2: NUMBER OF MARINE RESOURCES INCREASED IN (3) THREE YEARS TIME WITHIN THE MUR MANAGEMENT AREA. Objective 3: IN THREE YEARS TIME BEACH VEGETATION WITHIN THE MANAGEMENT AREA IS MAINTAINED AND IS IN A HEALTHY CONDITION. Objective 4: WITHIN THREE YEARS THE MMCC WOULD HAVE AQUIRED KNOWLEDGE AND SKILLS TO STRENGTHEN THE IMPLEMENTATION OF THE MANAGEMENET AREA. The designation of zones has been delineated by clans. There are two areas within the area (1) open to harvesting but with regulations and (2) Protected area. The following set of rules will apply to areas that are open to harvesting by the local communities. All penalties are outlined in table 7.3.1. The tambu or protected areas is banned from all forms of harvesting. These rules can be seen in table 7.3.1 and the penalties that will be enforced are also in the table. The following penalties will be imposed if rules are breached. 1.1 If there is a First time offender the MMC will give a first warning. 1.2. If it is the second time that the offender breaks the rule he or she will do community service. 2.2 Second time committed offence will do community service work. 4.1 If there is a first time offender the MMC will give a first warning. 5.1. If there is a first time offender the MMC will give a first warning. 6.1 Report the spillage to National Maritime Safety Authority (NMSA) and get report from them. 6.2 Take the report to the National Court level and charge K10,000?? 7.1 Take the matter to district court and be charged K5000.00?? 8.2 Second time to commit offence to be dealt with at the village court and fined K1000.00?? 9.1 If there is a first time offender the MMC will give a first warning. 10.1 If there is a first time offender the MMC will give a first warning. 11.1 If there is a first time offender the MMC will give a first warning. 11.3 Third time to commit offence taken to village court and fined K1000.00.?? 12.1 If there is a First time offender the MMC will give a first warning. 12.3 Third time to commit offence taken to village court and fined K1000.00. The management area will be managed by a Committee made of local community members. The rules outlined above will be enforced by the LMMA Committee and will be enforced through the village court system. The duties of the enforcement team is: (1) To ensure that rules are followed (2) Will apply and collect penalties (3) responsible for erecting of the sign posts. NOTE: Need a lawyer to interpret these laws and penalties and advise accordingly before we develop Contract Law (CD) or fill in the LMMA form. To ensure the effective management of the LMMA the following activities have to be undertaken by the committees and working with our partners, especially when there is need for technical support. Conduct awareness with individual clans, community members, students and school board. 9.1 A local monitoring team will be established and trained to carry out the community-based monitoring, which may include both biological and socio-economic information. 9.2 The monitoring to be done will also be assisted by partnership with MAKATA to provide technical expertise. The management plan will be reviewed annually (or in three or five years??) for adaptive management purposes. If there are changes that need to be done to the document the MM LMMA committees in consultation with the community may make necessary changes during the review of the plan. Chairperson: He/she is responsible for ensuring each committee member is carrying out his/her duties. He/she also has the responsibility to speak at community meetings, with the Ward Member, and the Local Level Government. Treasurer: He/she has the responsibility to account for monies given to the Marine Management Committee from fine collected when rules are breached. Secretary: He/she takes minutes during meetings and deals with documents that are received or sent by the Marine Management Committee. · Police /Enforcement Officers (4): This team will ensure that all rules are followed in the management area and offenders dealt with accordingly.